And it’s fun for the students, too. 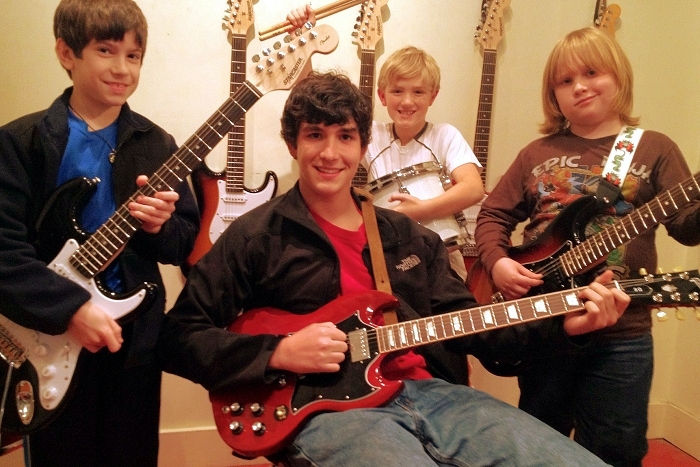 Here’s the setup: age-grouped kids who take lessons from one of Fondren Guitars’ instructors form bands, help choose songs and band names and rehearse for weeks ahead of some major event. This go around, it’s March 21’s Arts, Eats & Beats. The first incarnation in the fall of 2010 played for Fondren Unwrapped. Since then, four or five seasons have come from the program. The bands have also played for Broadmeadow’s Blocktoberfeast, St. Richard’s Fun Fest, St. Andrews’ Battle of the Bands and Mississippi Museum of Art’s Town Creek Arts Festival. Students have even enjoyed the live morning television spotlight. Harkins mentions upcoming opportunities that have implications statewide. Harkins says the purpose of the program is multifaceted. Rock Band can jump start a musical passion for life, he believes, if given the right opportunities. “When I was their age – middle school, high school…if I had been in the same situation where I had people around me to play with, I would have started even younger than I did,” Harkins says. “I’ve made it a life time, and a lot of my friends who are musicians have been doing this as a lifetime, too.” He notes students who have come out of the program who are already playing with bands that tour and play venues all over the state. Harkins notes, too, the program is a friendship builder. “We take someone who might not necessarily be on the football team but wants that same team spirit and we give them a team,” he says. “They’re in this together.” Harkins says many of the high school aged students who go to different schools and didn’t know each other before now hang out outside of rock band rehearsals and have become friends.